Now that our trick-or-treating days are over, the Halloween themed drinks and dishes are the best part of the spooky holiday. 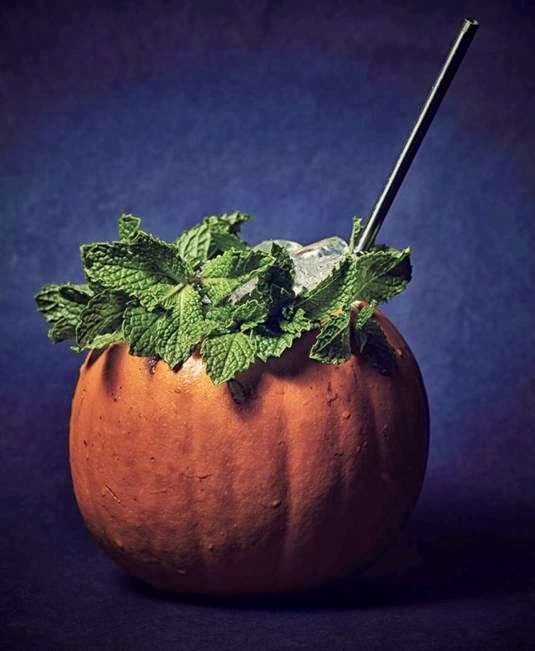 Alibi American Whiskey has created the perfect Pumpkin Patch Julep to add to your holiday inspired menu. My husband is a big fan of Alibi American Whiskey, Alibi American Whiskey is a smooth 90 proof blended whiskey that is easy to drink; any way you want to drink it. Alibi is excellent for shooting, sipping with your favorite beer or mixing with your favorite juice, soda or as a key ingredient in a great cocktail. Alibi is different than many of the small batch, single barrel, or micro distillery whiskeys that have come to market in recent years – no offense to them. Alibi is not there to be fussed over, debated or used as a muse for a seminar. It is not about its age or aroma – heritage or flavor notes. Alibi is there to be a part of a great night with friends, a night that hopefully ends up with a great story and probably the need for, well, an Alibi. Find them on the web, Facebook, Instagram and Twitter. Shake vigorously with ice and strain into chilled cocktail glass or hollowed pumpkin. 1. Cut stem off pumpkin and slice lengthwise. Clean out inside of pumpkin and brush with neutral oil (canola). 2. Roast pumpkin facedown in preheated oven at 350F for approximately 45-55 min. 3. Let cool for 10 minutes and remove skin with spoon. 4. Add pumpkin meat, apple, sugar, maple syrup, and spices into blender. Blend until smooth. 5. Spoon mixture into medium sized pot. Make sure there is enough room to top of pot for boiling. Cover with lid and prop open a bit with wooden spoon so that steam can escape. Over med-high heat, bring to a low boil. Reduce to low-med heat and cook for 10 minutes until mixture reaches desired thickness. 6. Cool completely and stir in lemon juice and salt.